I'm not outspoken, I don't make a big deal over the little things and I don't expect anything to be handed to me, I work hard and take pride in what I am able to do. I'm usually the quiet guy who listens and is writing and re-writing the story in my head over and over as information becomes available. Crammed in at the end of the photo area, photographers pushing in to get the shot in front, television crews pushing in their video camera from the back to get their shot, my night of being a photographer at the Pantelion Films red carpet "Compadres" premiere at the Archlight Cinema in Hollywood, California was anything but easy. As a blogger trying to get to cover entertainment isn't easy and it's not glamorous. For those who know me, I'm as polite and considerate as possible. So I gave up my spot at the front of the crowded carpet and used my telephoto lens and a platform to shoot over the photographers. Click after click shots become simpler to obtain, but I lost the direct shots where the walking the red carpet look right at my camera. Then one click, at one lucky moment, that one opportunity, the one photo that made the night, the struggle, worth it. A photo which when asked to share with People En Español's for their Instagram, with photo credit going to me, I was happy to do. I like sharing my photos and work for anyone, who finds it worthy to use, can use. The photo was used, but the credit did not go to me, the photo credit went to Pantelion Films, nothing against Pantelion because I enjoy the film's they put out. In an instant, my day was ruined and being a nice, considerate and a decent human being seemed pointless. Maybe I'm not cut out for this, maybe I'm not supposed to be covering these things and maybe I should be more selfish. 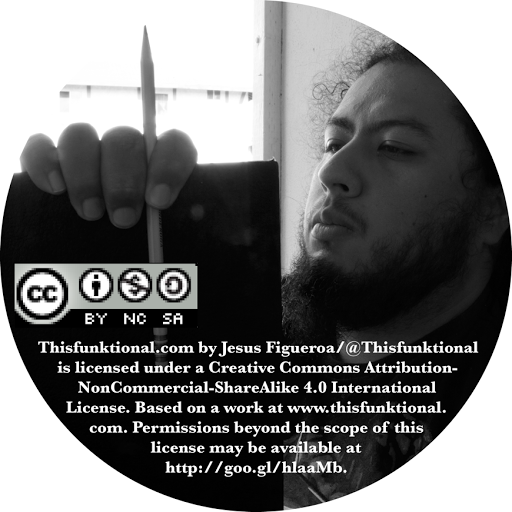 I am Jesus Figueroa and I run Thisfunktional.com and VIPLatino.com, I cover for iwatchmike.com as well as any outlet which needs coverage. I've written for Living Dead Magazine, SeFijaOnline.com and my college paper East Los Angeles College Campus News, to name a few. I've seen people pass me over on red carpets because they have no idea who I am, I've been put at the end of endless red carpets where I'm lucky to get anyone stopping to chat. I've had to work hard for the few opportunities I've been given, even when they haven't been the greatest of opportunities. Still I'm grateful to those who have given me these opportunities. Day-after-day I keep going, I keep going not because what I do brings me fame or fortune, I keep going because I pride myself in what I do and how I do it. I do my best on every project and work diligently to provide the best coverage. I pride myself on not being the photographer who is elbowing their way through a crowd of photographers to get a shot. Each photographer has a job to do and we each much do our best in the position we are given. I don't believe there's a photographer who is more important than others. I pride myself on not being the gossip writer that needs to rely on the sleaze of the day to have something impactful to say. There for I do my research to provide insightful coverage to everything. I pride myself on getting the best work done out of the opportunities I am given. It's not always the easiest thing to do, but sooner or later the opportunities will become easier to come by. I pride myself on not compromising my values to step my way over people to beat them to a story. I will not belittle my self or my name/brand. I've given others I've encountered through my studies the opportunity to join me on red carpets, press conferences and press days, when they are interested in covering entertainment events. I encourage those who want to blog, teach them how to get started and introduce them to people who can help them get invited to events. I'm not selfish, I don't do everything for money and, for me, the most important thing is to be a responsible and ethical journalist.